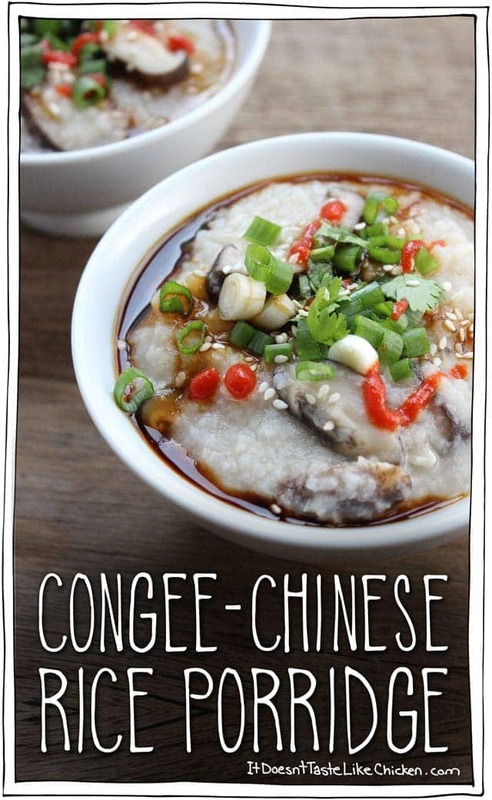 What in the world is congee, you ask? (Did you ask that? I am going to assume you did). 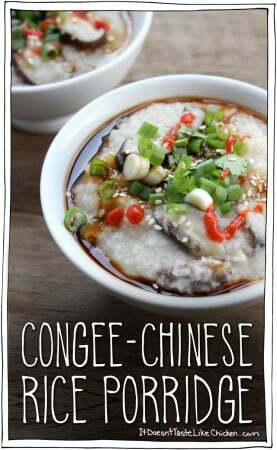 Congee is a savoury Chinese rice porridge, it’s also called jook depending on what region you are from. Have I mentioned that I have Chinese members in my family? If you have seen pictures of me, you might think I don’t look at all Chinese, and you would be completely right. You see, my cousin married a Chinese woman, and we liked her so much, that her family has merged with ours. Christmas dinner is now a mix of Canadian dishes, Chinese, Estonian (which comes from my aunt), and Italian (just because we like it). Back to congee. So I learned about congee from my Chinese side of the family. The basic recipe is 1 cup of rice and 10 cups of water. Simmer for an hour and a half, done. Anything else you add to it is up to you. Congee is actually pretty bland in flavour (just like porridge), so it’s really what you add to it that gives it that va va voom. Traditionally there is some sort of animal bone in there, which you may not be so surprised that I decided to opt out of for this recipe. 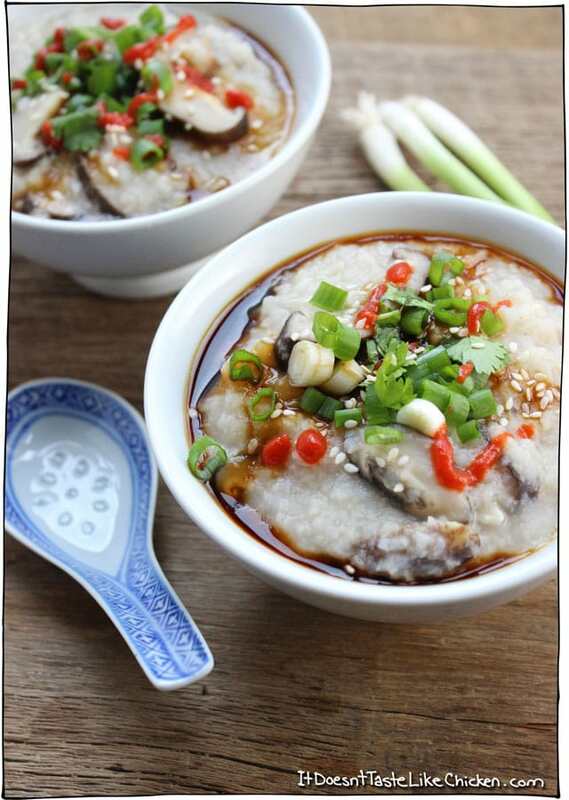 Instead to make my vegan congee I used dried shiitake mushrooms, which are gorgeously chewy and flavourful. Cooked them along with the rice, some ginger and garlic. When the congee is cooked, it becomes ALL ABOUT the toppings. I like green onions, cilantro, sesame seeds, soy sauce, Sriracha, and a few drops of toasted sesame oil. Gosh golly gee… wait, what’s the Chinese version of gosh golly gee? Google translate says Tiān nǎ tiān nǎ āiyā. I have no idea how accurate that is but I am going for it! 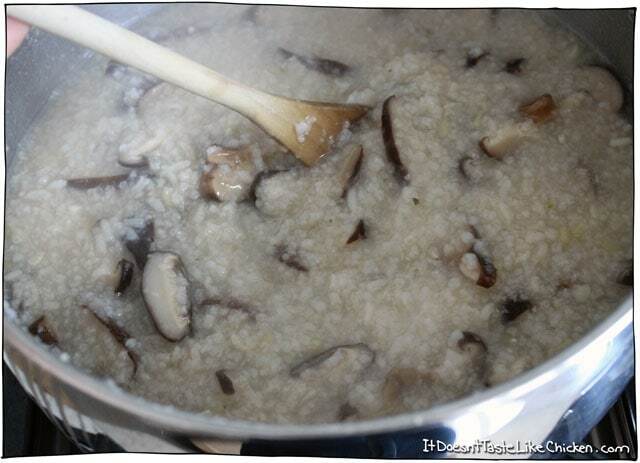 For my vegan congee I use a 2 inch piece of ginger, 4 cloves of garlic, 1 cup of white rice (you could use brown rice if you prefer), and 14 dried shiitake mushrooms. If your regular grocery store doesn’t carry dried shiitake mushrooms (mine does), you can find them at any Asian grocery store on online here. 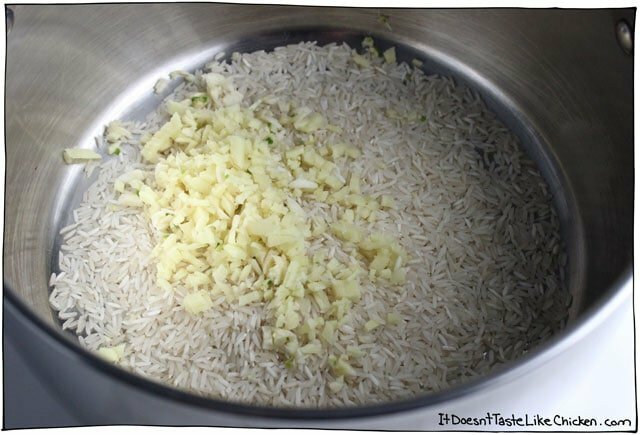 Add the rice, minced ginger, and garlic to a large pot, then add 10 cups of water. Yes 10. Bring to a boil and reduce to a simmer then set a timer for 1 hour and 30 minutes. In the meantime, bring some additional water to a boil. Put the mushrooms in a heat safe bowl and cover with the boiling water. They tend to float, so I put another bowl on top of the mushrooms and water to help them stay submerged. Let them soak for about 20 minutes until softened. Drain and discard the soaking water. Thinly slice the shiitakes and add to the simmering pot of rice. It doesn’t matter too much at what stage you add them, just as long as they are in there for at least 20 minutes, but I always put them in as soon as they are sliced. Stir the pot every now and then as it simmers, especially as it gets closed to being finished so that it doesn’t stick to the bottom of the pan. When an hour and a half has past the rice should have broken down completely and become a thick porridge. If you prefer a thinner consistency, add more water until desired consistency is reached. Serve with all your favourite toppings. If you are serving a group, it’s fun to give a large variety of toppings, so everyone can garnish their own congee to taste. Only 5 ingredients! So easy to make, affordable, and healthy. I love that you can top this with whatever you like making each bowl totally customizable! Vegan, vegetarian, and gluten free. Or anything you think would be delicious! Add the rice along with the ginger, garlic, and 10 cups of water to a large pot. Bring to a boil and reduce to a simmer and set a timer for 1 hour and 30 minutes. In the meantime bring some additional water to a boil. 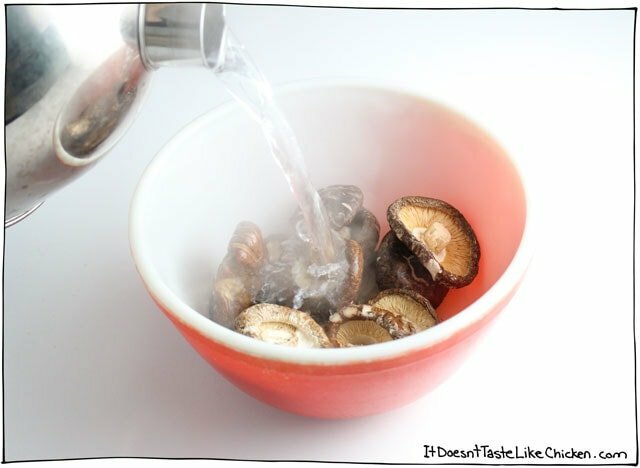 Put the dried shiitake mushrooms in a heat proof bowl and cover with the boiling water. They tend to float, so I usually put another bowl on top of the mushrooms and water to help keep them submerged. Let them soak for 20 minutes or so until tender. 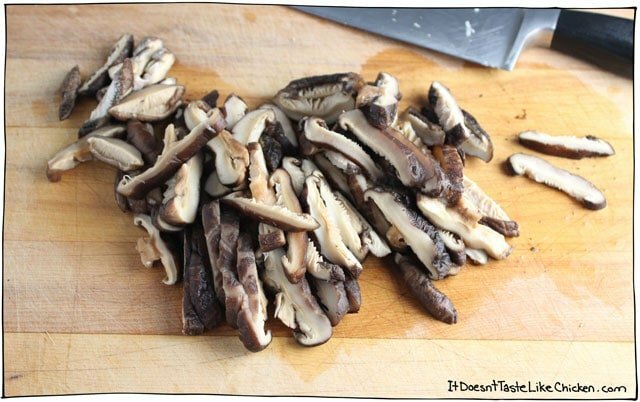 Drain and discard the soaking water, then thinly slice the shiitakes. Add the sliced shiitakes to the simmering pot of rice. 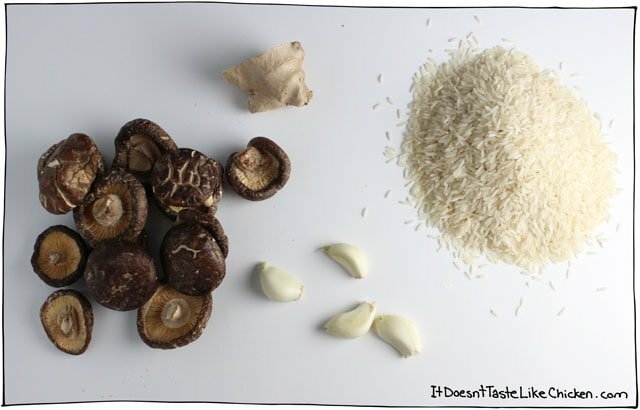 It doesn't matter too much when you add the mushrooms, as long as they are in there with the rice for at least 20 minutes, but I always add them as soon as they are sliced. Stir the pot every now and then as it simmers, especially as it gets closed to being finished so that it doesn't stick to the bottom of the pan. When the congee is done it will be a thick rice porridge. If you prefer a thinner congee, add water until desired consistency is reached. Serve along with toppings of your choice. I like sliced green onions, chopped cilantro, sesame seeds, Sriracha, a few drops of toasted sesame oil, and soy sauce to taste. YAYAYAYAYAYYAY Sam!!! Love it!! BTW this freezes for the people who were saying that it makes a lot. Then you have breakfast a microwave away! I was lucky enough to discover congee as a vegan breakfast choice on a cruise of all places! They had a large bar of toppings so I could try a different combo every day. I never got sick of it. But when I tried to make it at home it never turned out right and this one is exact!!! Thanks so much! I will eat and think of you!! Oops.. Forgot.. My fav toppings? Sesame oil, sour plum and dried, shredded seaweed!! Do you cover the pot when cooking or leave it uncovered? Thank you for the recipe, it sounds yummy! You don’t need to cover the pot, just make sure its a low simmer. Enjoy! awesome receipe! how much seasoning e.g. soya sauce do u put normally? Sam, ive noiced this recipe makes a large amount. im only on my own. If i were to make it for 2 people instead of 8 does that affect cooking time? Hi Sarah! Nope, the cook time should be the same, just make sure it’s at a low simmer. Congee is basically mush, so you don’t really have to worry about over cooking it… in fact, that’s kind of the point. Haha. Enjoy! This recipes works well. My suggestion for an even more robust chicken like flavor is to add a couple of Not-Chick’n Cubes from Edwards & Sons or a couple of teaspoons of veggie bouillon (I like The Better Than Bouillon brand). You’re most welcome! I hope you and your family feel better soon! I don’t get a ready-made Sriracha where I live (Austria), which does not contain one or another unhealthy additive…but what I can get here is tasty, 100% curry paste. I suppose if you fry a little bit of curry paste for 30sec and mix it with the sesame oil, you might get a healthier sriracha alternative for topping? Just a basmati or jasmine rice will work fine. Sriracha is actually a hot sauce and does not have a curry flavour, so any hot sauce would be a good substitute 🙂 Enjoy! 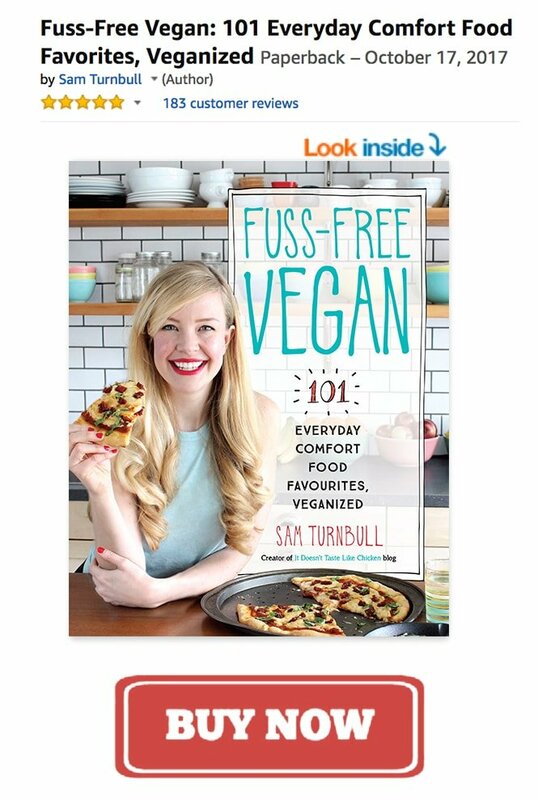 Dear Sam, I never knew vegan congee was possible. I followed your recipe exactly but used brown rice and home made vegetable stock instead. I dressed the congee with soy sauce; siracha; sesame oil, topped with spring onions and edamame. The end result was mind blowing. My 14 year old who almost always never finish her standard bread/sausage/tuna/eggs breakfast finished the entire portion of the vegan congee I gave her. Thank you so much for the inspiration and giving me the confidence that it is possible to let my family eat more healthily through a plant based diet. I appreciate also, the detailed instructions and attractive photos that accompany the recipe. Thank you once again! Awesome, thanks so much Sam!!! SCORE! I just finished eating two delicious bowls of your fabulous congee recipe! I used my rice cooker. Living in HK, I am able to easily get all of the ingredients and it’s totally authentic. I’ve had many bowls of congee in restaurants and your recipe is just as good. In fact, I think it’s even better bc it’s vegan. So thank you very much for letting us all know that congee is “all about the toppings” and for sharing your recipe and extended family story. I am now adding VEGGIE CONGEE to my culinary repertoire. YUM!!! Could you use wood ear mushrooms instead of shiitake? I imagine so, but just want to ask. I love congee. This recipe is very similar to how I make it, though I sometimes add some peas and/or carrots toward the end of the cooking time. It is also easy to prepare in a slow cooker, so that it is ready for my breakfast in the morning. Thanks for posting this. I adore congee! I like it with a bit of fermented black beans, or maybe some kimchi. Something salty and spicy to pump up the jam. But you can use whatever you like. Thanks for the easy recipe and topping ideas! really loved it….its so easy to make..and plus point (it taste good)as well…!!! I made this recipe last night and YUM! I added marinaded tofu, sesame oil, and edamame. I’d post a photo, but that doesn’t appear to be an option in the Comments section. Keep up the great work, Samantha! How wonderful, Sam! Another fabulous addition to congee is to dice up some taro root and throw it in the mix 🙂 My mom does that and the taro lends extra heartiness and creaminess to the congee 🙂 The flavor is amazing as well, it is very aromatic! Like a potato, but better! Ooooh, you have me dreaming of taro root! I am not sure I have ever tasted it before, but I am going on the hunt for it now! Thanks for the tip Angela. I don’t think I have seen such a colourful congee before. Your toppings look fabulous. Perfect for a cold night. Aww thanks Janet! 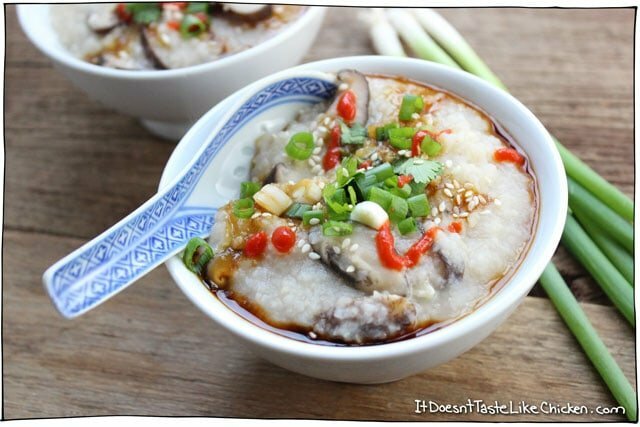 Yes, I love congee on cold nights, and we have a lot of those coming here in Canada! Eek. Just made this for breakfast and WOW! Love it. Used regular mushrooms as I had no dried ones on hand. Kept it simple and topped with just liquid aminos, toasted sesame oil, chopped scallions and of course siracha…. and I CAN’T STOP EATING IT hahahahhaa! My vegetarian son was intrigued by the photos and made me promise to save some for him so he can try it, too. This is going to be a staple in our home from now on, guaranteed. A perfect comfort food, especially for this time of year! This is new to me and it is really inspiring, an interesting porridge indeed. Looks so healthy and vibrant. Very nice! Some years ago I read in comments on a congee recipe that many asians eat it when they have tummy trouble. I wasn’t up to eating the savory version the next time a gastrointestinal bug hit our family, so I cooked just plain rice with a little salt, and we ate it like we would oatmeal: brown sugar and bananas or canned peaches. Worked well as part of the BRAT diet our doctor suggests. I work with small children, and though I teach them hygiene as part of the deal, they still share EVERYTHING! Now when we’re sick I start a batch of rice porridge in the slow cooker as soon as I realize what’s going on, but use boiling water to give it a head start. By the time we feel up to trying food, it’s ready to go. I usually make a big batch, then we reheat leftovers. I worry a bit about the rice sticking if it’s not stirred often enough, especially towards the last. Googling a bit, though, I found numerous recipes for making congee in a slow cooker. 7-8 hours on Low setting seems to be the standard. One slow-cooker recipe recommended stirring a teaspoon of “neutral oil” (canola or some other mild-flavored oil, I presume) into the dry rice before adding water. Not sure about that idea, seems more to keep rice from sticking, and might up the cooking time to let the water fully penetrate the thin oil coating on the rice. Another slow-cooker recipe went with the 7-8 hours on Low, but suggested turning the slow cooker to High for a half hour before serving. I use the Instant Pot electric pressure cooker for congee. Bring it all to a boil using Saute mode, then switch to slow cooker mode at low setting for 1-1/2 hours. Perfect every time and no sticking! I’ve actually heard of jook before, but can’t remember eating it. I imagine brown rice doesn’t have enough surface starch to work in this recipe, eh? Brown rice works just fine in this recipe, I tried it both ways. The congee has a bit more texture with the brown rice, but there isn’t much difference other than that. I hope you like the recipe! Love this!! Never heard of it but I am drooling! I used to live in Taiwan years ago and loved congee. Thank you for reminding me and making a vegan version. You are FABULOUS at what you do..keep up the good work to help change our health and the planet. Can’t wait to make this…yum. Woot woot!!! Thank you Sammie! !